The National Science Foundation (NSF) is one the US government agencies that was created to “promote the progress of science; to advance the national health, prosperity, and welfare; to secure the national defense.” They do this by funding basic research in science and engineering to the tune of $7.5 billion dollars a year (FY 2016), which is less than 0.05% of the total federal budget. The NSF is currently sponsoring the Center for Advanced Self-Powered Systems of Integrated Sensors and technologies (ASSIST) as they try to develop energy harvesting nanotechnology. The goal of ASSIST is to have wearable nanotechnology that can monitor both the individual and the environment. Research at ASSIST focuses on five integrated technologies: (1) energy harvesting and storage, (2) low-power nanoelectronics, (3) low-power nanosensors, (4) integrated systems on a chip, (5) and wearability. An ambitious goal is to integrate these research areas to a single piece of technology, a suit that monitors the wearer’s vital while simultaneously monitoring the environment, all powered by the wearer’s body heat. Researchers at ASSIST see this as an innovative way to gather health data leading to rapid diagnosis and treatments; diagnostics could include electrocardiograms, electromyograms, and electroencephalograms. The graphic novel enthusiast in me rejoices at the potential realization of a batsuit. The ASSIST team first developed a method to harvest and store energy. They used piezoelectric materials with active voltage amplifiers to collect body heat as an energy source. The piezoelectric effect is the ability for some materials to generate an electric charge when a mechanical stress is applied, like moving or rubbing together. The team embedded thin films into the material that decrease heat permittivity, increasing energy harvesting by a factor of 10. To store the energy, the team researched technologies that lay between conventional batteries and capacitors. Batteries are electrochemical devices that drain slowly and give a constant voltage during its charge cycle before rapidly dropping off. Capacitors are electrostatic, storing energy on surfaces and hold smaller charges that will discharge very quickly with a linear voltage. The team approached energy storage by using a hybrid supercapacitor system, which holds more charge, and a nano-electrochemical supercapacitor to slow the discharge. Their system can already hold three times as much energy than conventional electrodes, but the team anticipates further research to push this boundary. With working being done on powering the suit, other research areas are working on developing the circuitry and nanoscale devices that the suit will use. The team will take the latest advancements in nanoelectronics to design a system that is energy efficient since energy will be limited while using non-volatile processors. A volatile processor (taken from volatile memory) is one that needs a constant power supply to operate; if the power is removed the processor will cease being a processor, forgetting its coding. The team envisions using technologies like low-voltage steep-slope transistors, ferroelectric RAM, and ultralow-power microprocessors tailored into the piezoelectric-embedded cloth materials. 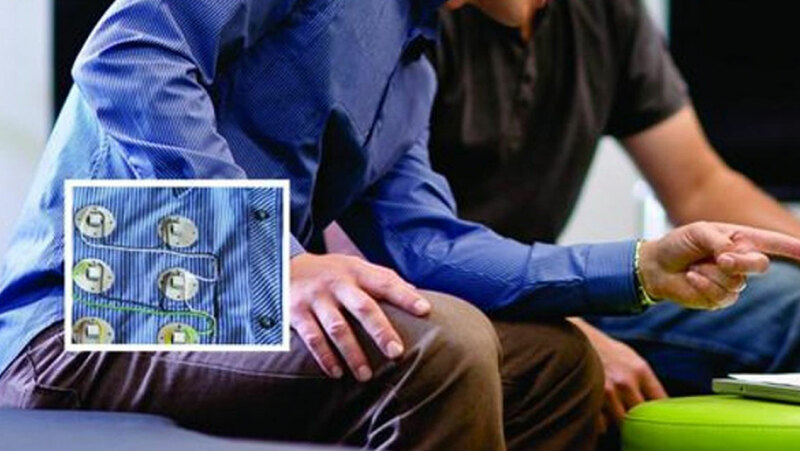 With the energy source and electronics in place, ASSIST will focus on developing arrays of low-powered wearable nanosensors to monitor both the physical environment and the physiological parameters of the individual wearing the technology. The ASSIST program is currently investigating gas, bioelectric, biophotonic and biochemical sensors to equip their suit. Of these technologies, the bioelectrical analysis is relatively well established and is commercially available, but the team here envisions an integrated system that can monitor multiple factors at once. For sensing the local environment, the team is pursuing atomic layer deposition-based thin films to monitor gasses like ozone, nitrous oxide, and nitrogen dioxide. Polymer films will be used to detect volatile organic compounds. The biggest challenge is translating the technology from the lab into a practical device that minimizes power dissipation while maximizing analyte selectivity. For bioanalysis, the researchers are looking into sweat analysis for non-invasive monitoring of blood-sugar levels. The ASSIST project is ambitious and will require a lot of innovation. Whether fully or partially successful, it will revolutionize global healthcare and nanotechnology.